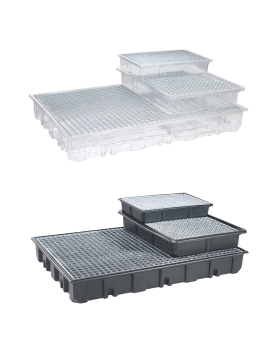 Plastic sump trays thermoformed in one piece. 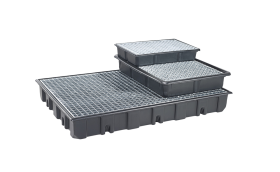 Safety sump trays are required where substances hazardous to water are used, stored or transported. The tray is a safety measure to avoid that unplanned leaking liquids contaminate the soil or groundwater. With a tray the environment and your hall floor are protected as well as your employees for whom leaking liquids can provide a hazard. Advantages of plastic trays are et al. the low tare weight and the easy handling. KIGA trays are thermoformed in one piece and thus have no welding seams which can leak or become leaky. 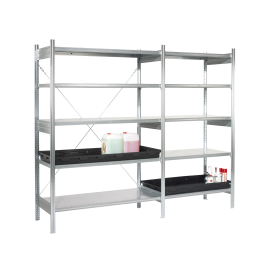 The plastic trays provide a high resistance against most of all acids and lyes, lubricants and oils. 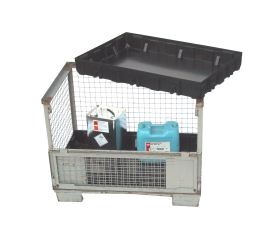 A sump tray has to collect 10 % of the stored liquid quantity, however, at least the quantity of the largest container. 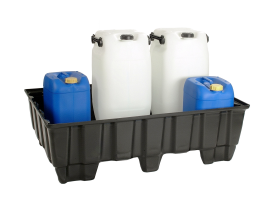 This calculation is a non-binding rule of thumb for containers up to 1000 litres located outside of water protection areas (here 100 % have to be collected) and can vary depending on the type of substance. Basically, the law applies, et al. German Water Resources Act (WHG) or the Chemicals Act (ChemG). Almost every KIGA sump tray is approved by Deutsches Institute für Bautechnik (German Institute for structural Engineering) and may be labelled with the compliance mark (RCM).